Marlborough House is a mansion in Pall Mall, built in 1709–11 for the Duke and Duchess of Marlborough, on part of the site of the St James’s Palace pheas­antry. The duchess commis­sioned Sir Christopher Wren to design the house, though the plans were drawn up by his son, Christopher Wren the younger. She super­vised the house’s completion herself after falling out with Wren and sacking him (the duchess made a habit of falling out with people). The house is built of red Dutch bricks that were carried as ballast on the return journeys of vessels that had trans­ported soldiers to Holland to fight under the Duke of Marlborough. Inside the house, paintings of the duke’s battles line the walls of the central salon and the stair­cases. The dukes of Marlborough occupied the house until 1817, whereupon it reverted to the Crown. Its residents there­after included several royal widows and Edward, Prince of Wales (later Edward VII). Sir James Pennethorne, chief architect of the Office of Works, oversaw extensive alter­a­tions to the house in 1863 to suit the prince’s require­ments. During Edward’s occupancy it became the centre of fashionable society and his inner circle became known as the Marlborough House Set. 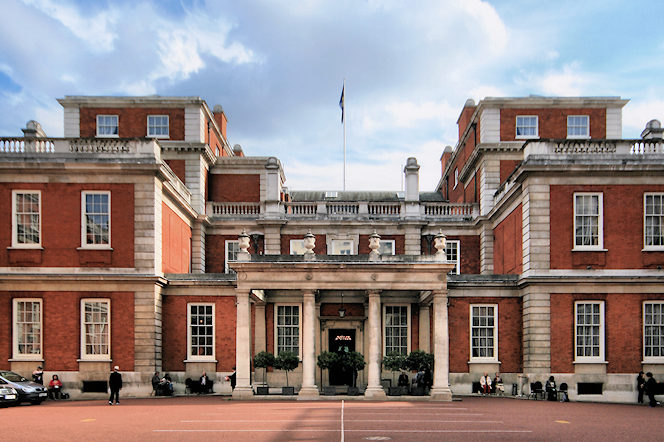 In 1959 Marlborough House was given to the government and it is nowadays home to the Commonwealth Secretariat and the Commonwealth Foundation. A number of independence negoti­ations have been held here. The house is not usually accessible to the public but in recent years parts have been opened up for viewing on the Saturday of London Open House weekend.